WASHINGTON, D.C., and CAMBRIDGE, Mass. — The U.S. solar energy industry had a banner year in 2010 with the industry’s total market value growing 67 percent from $3.6 billion in 2009 to $6.0 billion in 2010, according to the U.S. Solar Market InsightTM: Year-in-Review 2010 released today by the Solar Energy Industries Association® (SEIA®) and GTM Research. Solar was a bright spot in the U.S. economy last year as the fastest growing energy sector, contrasting overall U.S. GDP growth of less than 3 percent. In total, 878 megawatts (MW) of photovoltaic (PV) capacity and 78 MW of concentrating solar power (CSP) were installed in the U.S. in 2010, enough to power roughly 200,000 homes. 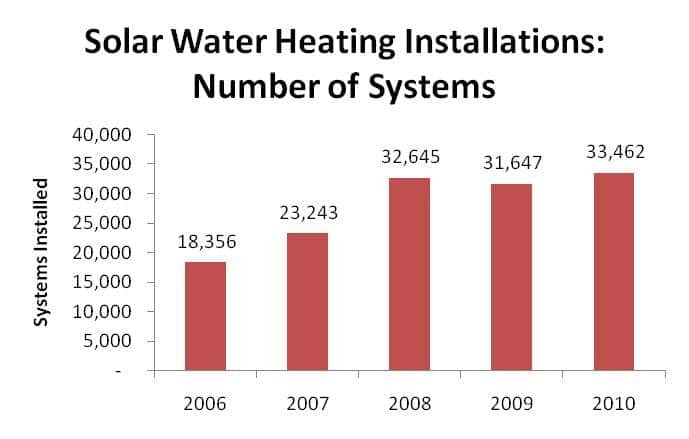 In addition, more than 65,000 homes and businesses added solar water heating (SWH) or solar pool heating (SPH) systems. The U.S. PV market made the most significant strides in 2010, more than doubling installation totals from 2009 according to the latest U.S. Solar Market InsightTM report. This expansion was driven by the Federal section 1603 Treasury program, completion of significant utility-scale projects, expansion of new state markets and declining technology costs. The section 1603 Treasury program helped fourth-quarter installations surge to a record 359 MW and was critical in allowing the solar industry to employ more than 93,000 Americans in 2010. Originally set to expire at the end of 2010, the 1603 Treasury program was ultimately extended through 2011. In addition, market diversification was a distinguishing characteristic of U.S. solar energy development in 2010. Sixteen states each installed more than 10 MW of PV in 2010, up from only four in 2007. 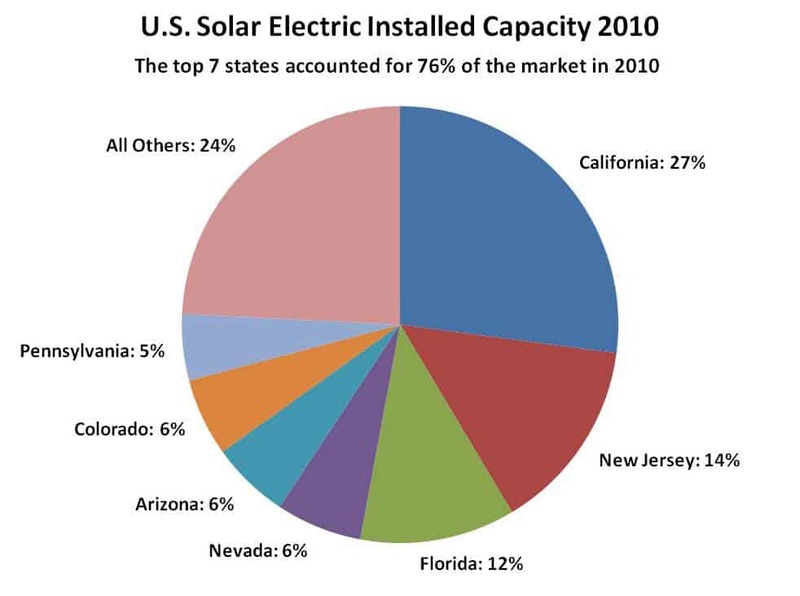 The top 10 states for PV installation in 2010 were: California, New Jersey, Nevada, Arizona, Colorado, Pennsylvania, New Mexico, Florida, North Carolina and Texas. Cost declines were also an important factor in the 2010 solar expansion, as technology costs fell and the industry matured further, capitalizing on greater economies of scale and improved installation practices. In the residential and commercial-property segments, installed annual PV system cost declines of 8 percent and 11 percent respectively spurred record build-out. Along with analysis of the U.S. PV market, U.S. Solar Market InsightTM: Year-in-Review 2010 provides visibility into the CSP and solar heating and cooling markets. The 75 MW Martin CSP plant installed in Florida is the largest to come online in nearly 20 years and foreshadows a pipeline of more than 9 GW of CSP projects under development. In addition, for the first time in 2010, the federal government approved permits for CSP plants on public land. Meanwhile, the solar heating and cooling markets grew in 2010. The top five states for solar water heating installations in 2010 were California, Hawaii, Arizona, Florida and Puerto Rico, while the top five for solar pool heating were Florida, California, Arizona, New York, and Illinois. Fluctuating natural gas and heating oil prices will determine the future of these markets. • The total value of U.S. solar market installations grew 67 percent from $3.6 billion in 2009 to $6.0 billion in 2010. • Solar electric installations in 2010 totaled 956 megawatts (MW) to reach a cumulative installed capacity of 2.6 gigawatts (GW), enough to power more than half a million households. • Grid-connected PV installations grew 102 percent in 2010 to reach 878 MW, up from 435 MW in 2009, bringing cumulative installed PV capacity in the U.S. to 2,086 MW. • Sixteen states installed more than 10 MW of PV in 2010, up from four states in 2007. 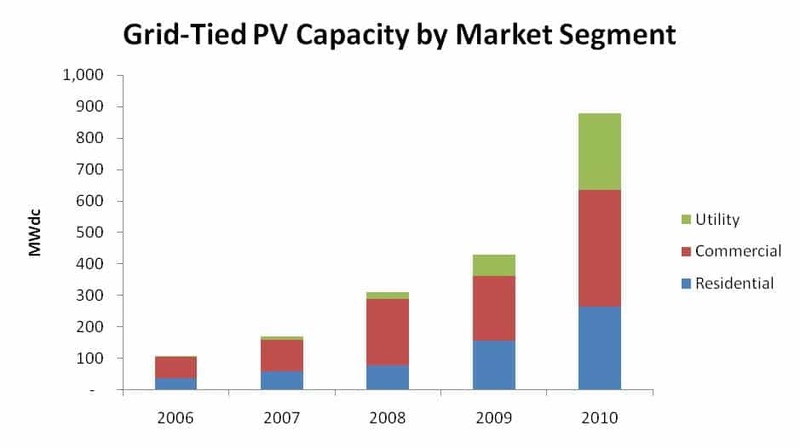 • Utility PV installations more than tripled in 2010 to reach 242 MW, up from 70 MW brought online in 2009. • U.S. manufacturing of PV components increased substantially year-over-year for wafers (97 percent growth), cells (81 percent growth), and modules (62 percent growth). • The 75-MW Martin Next Generation Solar Energy Center was completed in 2010; it is the largest U.S. CSP plant to come online in nearly 20 years. • Cumulative CSP capacity from all 17 operating plants reached 507 MW in 2010. • For the first time, the federal government approved permits for seven CSP plants on public land, which add 3,560 MW of new capacity. • 35,464 SWH systems and 29,540 SPH systems were installed in 2010 alone, heating a total of more than 65,000 homes, businesses and pools. • California maintained its position as the leading installer of SWH systems in 2010 as the overall market grew 5 percent. The full report analysis (with details of technology segments, manufacturing volume and forecasts by state) is available to purchase for $2,495 for the individual report and $7,995 for an annual subscription of the four quarterly reports. SEIA members receive a 50 percent discount on an annual subscription and more than half off the price for the individual report. Established in 1974, the Solar Energy Industries Association® is the national trade association of the U.S. solar energy industry. Through advocacy and education, SEIA is working to build a strong solar industry to power America. As the voice of the industry, SEIA works with its 1,000 member companies to make solar a mainstream and significant energy source by expanding markets, removing market barriers, strengthening the industry and educating the public on the benefits of solar energy. GTM Research, a Greentech Media company, provides critical and timely market analysis in the form of concise and long-form market research reports, monthly newsletters and strategic consulting services. GTM Research analysis also underpins our webinars and live events. Our analyst team combines diverse backgrounds in the energy, environmental, emerging technology, investment banking, information technology and strategic consulting sectors.